Of all the forms of inequality, injustice in healthcare is the most shocking and inhumane. –Dr. Martin Luther King, Jr.
A few years before I was born (in 1966), my maternal grandmother (African American) died of a stroke. She’d also had metastatic colon cancer, so had the stroke not gotten her first, she was looking at a short but very painful passing. She had been symptomatic for a long time, but as the sole source of income, she couldn’t afford to take off work to see a doctor. Along with my maternal grandmother, my maternal grandfather (Japanese) died of pancreatic cancer. By the time he was diagnosed it was too late for treatment. It was already at stage 4. He died within months of his diagnosis. My paternal grandmother had malignant melanoma that spread to her brain. Hers was detected very early on but her diagnosis came during the Great Depression and treatment was out of reach. My mother was 61 when she died of a stroke. She rarely saw a doctor—even when she complained about her head feeling like it was on fire and the only relief she was able to have was when she put her head in the freezer for several seconds. And we weren’t poor or without health insurance. My father’s job in television afforded us excellent health insurance and access to great doctors. By contrast I see the doctor whenever something is out of whack. I have had more than a dozen surgeries, including a hysterectomy caused by fibroids, removal of polyps from my colon when I was 28, and removal of malignant melanoma from my face and back in my mid-30s. I don’t know whether my inclination as an adult to visit a doctor has anything to do with my mother rarely taking my brothers and me or herself to one, or because I refuse to ignore obvious symptoms that are out of the ordinary: excessive and chronic pain, blood where and/or when it shouldn’t be present, changing moles, frequent migraines and bouts of vertigo, etc. It’s been very rare that a doctor hasn’t found something to warrant further testing (MRIs, CT Scans, biopsies, etc. ), and when necessary, surgery. Although my brothers and I are the same mix of races, unlike them I am White presenting, which I believe has played a big part in why my experiences with doctors have been different from my brothers—who both refuse to see doctors. This has made me wonder if access isn’t the only issue behind racial disparities in cancer diagnoses and treatment. I believe it’s a multilayered issue. Is It Really Access or Something More Insidious? Although Whites are diagnosed with malignant melanoma more than any other racial group, African Americans have a significantly lower survival rate. Despite the discovery that cervical cancer is more often than not caused by the human papillomavirus (HPV), which is usually caught in a routine pap smear, African American women were the least likely to receive the cancer screening. While there is increased awareness about breast cancer, which includes routine mammograms, by the time Black women and men are diagnosed with breast cancer, it's usually advanced-stage, resulting in significantly higher mortality rates than White women. African Americans have twice the likelihood of dying from stomach, colorectal, lung and prostate cancers. The National Center for Biotechnology Institute (a division of the National Institute of Health) published a paper in 2017 that speaks to biological differences between people of African and European descent. 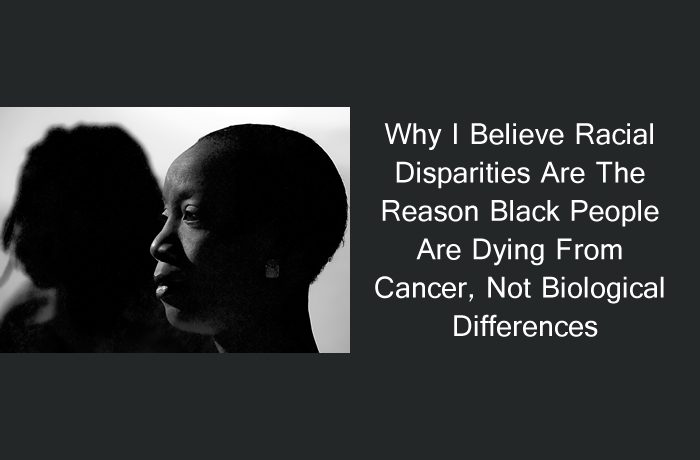 They conclude it’s these biological differences that account for why people of European descent are more likely to be diagnosed with myriad forms of cancer but that people of African descent are more likely to die from those same cancers. My belief is that what White researchers view as culture being a factor in racial disparities is a cart-before-the-horse issue. I believe it’s built into our psyche not to go to a doctor unless we show signs of grave illness, because doctors—in particular White doctors—are dismissive of us. I also don’t believe my conclusions are anecdotal. Returning to the so-called biological differences between people of color and Whites, the Proceedings of the National Academy of Sciences published a paper in 2016 that would be insulting if it weren’t laughable and telling about how White doctors and med students view us. Our nerve endings are less sensitive than White people’s. Our blood coagulates faster than White people’s. Whites have larger brains than we do (been hearing that and that Blacks have lower IQs lie for years). Whites have more acute hearing than PoCs. We have thicker skin and denser bones than Whites. We are more fertile than Whites. Our immune systems are stronger. There are others, but I think you get the picture. Wherever these fallacies came from, the fact is doctors see all people of color, but specifically African Americans, as being biologically different from White people. And what’s worse is that these beliefs about Black people, coupled with inherent racism in many White people, play a role in why we see doctors far less frequently than White people. White people go to the doctor and their concerns are listened to carefully. Tests are run, which may or may not lead to more tests and eventually a diagnosis. If African Americans are met by a doctor who sees them as being biologically different from their White patients and on top of that tend toward racism, we just don’t return. And worse, that experience will factor into whether we see a doctor for another issue. Now we’ve got a domino effect going. We’re not eating as well as White people. We have to decide what’s more important: paying an overdue bill, eating, or going to a doctor who may or may not listen to us. Once African Americans do go to a doctor it’s because the pain is unbearable, there is blood where and when there shouldn’t be any, the lump is too large to ignore, etc. So, I do really believe there are several factors that can explain racial disparities. And returning to the topic of the so-called biological differences between African Americans and White people: In 2002, Stanford researchers conducted a study they called the Genetic Structure of Human Populations. They looked at autosomal microsatellite loci of 1,056 people from 52 populations and seven geographical regions around the world. They discovered the racial lines are far more blurred than most of us are led to believe. If you’ve ever taken a biological anthropology class, you know what African Americans or those of us who are mixed with Black ancestry have known for eons: that race is a social construct. Stanford looked at over 4,000 alleles and found that over 92 percent of alleles were present in two or more regions, and nearly half of the alleles they studied were found in all of the seven geographical regions they looked at. Conclusion: We are far more alike than we are different, and if doctors and researchers want to tell themselves it’s our culture and our biological differences that account for racial disparities, they’re full of it. There is one reason and one reason alone why African Americans and other people of color are far more likely to die of cancer and other illnesses. Nothing has changed in the 52 years since Dr. Martin Luther King, Jr. summarized the racial disparities in access to healthcare. This was originally published with Blavity and it is republished with permission.